Is there anything more exciting than the prospect of a new Cameron Crowe movie starring Matt Damon, featuring a score by Sigur Ros frontman Jónsi, about a father who moves his family into an abandoned zoo? I doubt it! This already sounds—and looks—like it's going to be a highlight of the winter movie season. USA Today has just unveiled a big batch of first look photos, along with an entire feature about the new Crowe film, which also stars Scarlett Johansson, Elle Fanning and Thomas Haden Church, all of whom can be seen in the new photos below. Crowe has been tweeting photos, but these are finally official shots to see. 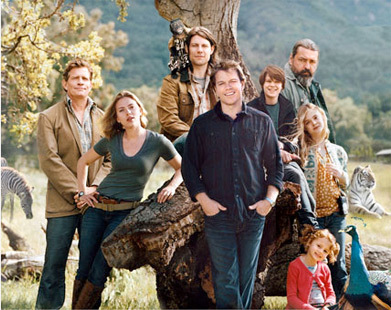 That group photo (which is just a composite) contains: Thomas Haden Church as Benjamin's accountant brother, Duncan; Scarlett Johansson as park caretaker Kelly Foster; Patrick Fugit as handyman Robin, with monkey Crystal; Colin Ford as Benjamin's son, Dylan; Angus MacFayden as Peter MacCready; Elle Fanning as all-around helper Lily, Kelly's niece; and Maggie Elizabeth Jones as Benjamin's daughter. In the article, Damon confirms that Crowe assigned him music to listen to. "He gave me the film Local Hero," a 1983 flick about an American oil company rep who's transformed by a small Scottish town. "And he gave me about 15 songs, a lot of Neil Young and Eddie Vedder. I actually took the music, put it on my iPod and went for a run in Central Park. Then I read the script. I thought to myself, 'This is absolutely something I want to be in.'" We Bought a Zoo, adapted from Benjamin Mee's memoir, is about a father who moves his young family to the countryside to renovate and re-open a struggling zoo. The film is directed by Oscar winner Cameron Crowe, from a screenplay written by Crowe and Aline Brosh McKenna (The Devil Wears Prada, 27 Dresses). 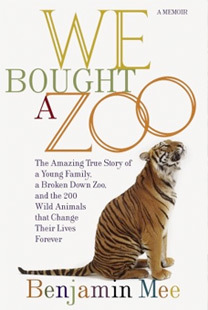 Fox will be bringing We Bought a Zoo to theaters on December 23rd this year. i hope THC brings the same kind of zany quirkiness to his character that he had in "smart people".